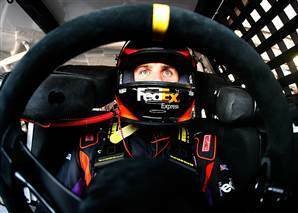 Denny Hamlin finished 13th in Saturday night’s Coke Zero 400 at Daytona International Speedway, surviving a variety of wild crashes during two ‘green-white-checkered’ overtime restarts and spinning through the infield grass to the finish line in the #11 FedEx Express Toyota Camry. Hamlin took the green flag for the final restart in fourth place behind draft partner Ryan Newman, and the pair was alongside the leaders on the backstretch of Daytona’s 2.5-mile oval. Another duo with a run made a move to Hamlin’s outside, causing the #11 to lose contact with Newman’s #39, and they slipped back in the running order. They hooked back up at the white flag on the cusp of the top-10 and were building momentum to move back to the front, but a multi-car incident in turns three and four coming to the checkered flag caused both drivers to scatter, Hamlin into the grass and to the finish line in 13th place. The tandem draft style used at the restrictor plate tracks (Daytona and Talladega) was prevalent throughout Saturday’s 170-lap event, and Hamlin and Newman were content riding around deeper in the field to avoid any wrecks at the front for most of the first two-thirds of the race, switching positions to keep their engines cool. As the laps clicked, they moved towards the front, and Hamlin led once for four laps after starting 36th. Green flag pit stops cycled twice in the 50 laps, and Newman and Hamlin were running one-two when the caution flew with two laps to go in regulation. They started from those positions on the initial “green-white-checkered” attempt, but a multi-car wreck behind them caused another caution and the second attempt. The finish kept Hamlin 11th in the NASCAR standings following Daytona, just three points behind Newman for 10th. He is 91 points behind new leader Kevin Harvick. Kentucky Speedway will play host to its first-ever NASCAR Sprint Cup Series race on Saturday night. Hamlin has made two NASCAR Nationwide Series starts on the 1.5-mile track located in Sparta, with a best result of third in 2006. During that race, Hamlin started on the pole and led 23 laps. In his first race at Kentucky in 2005, Hamlin started fifth and finished 15th. Saturday night’s race marks the halfway point of the 2011 Sprint Cup Series season and the 18th of 26 ‘regular season’ season that will determine the Chase for the Sprint Cup participants. Currently, Hamlin sits in one of the two Chase ‘wild card’ spots, given to the two drivers with the most victories outside of the top-10 in points but inside the top-20. Hamlin has led laps in each of the last six races, starting at Charlotte on May 29. To teach area children that it’s never too early to learn how to prepare for emergencies, Hamlin, FedEx and the American Red Cross are teaming up to host a preparedness event Wednesday at the Portland Community Center in Louisville. Hamlin will work with the children to prepare kits to bring home to use in the event of an emergency. As part of the company’s commitment to supporting disaster preparedness and relief efforts around the world, FedEx is also donating $10,000 to the American Red Cross Louisville chapter. The Mississippi Valley FedEx Ground district currently leads the company in quality package care, and will be recognized with its “MISV” code letters on the b-post of the #11 FedEx Ground Toyota this weekend. Are you looking forward to the first Cup Series race at Kentucky Speedway? Do you like the FedEx team’s chances at victory on Saturday night?